We have been quoted in a recent issue of a trade organ, "Portrait," as having withdrawn certain claims that we had made some two years ago as to the number of prizes taken at the Missouri convention of that year. We more than admit it - we call attention to the fact that we did at the time acknowledge our error. We had been misinformed and when we got the correct information we immediately published it. Will the publishers of that trade organ be equally frank? IOWA. In Studio Light for September we published the names of the photographers who had been awarded prizes on Eastman papers at the Iowa convention. There were eight of them, including two first prize winners and the winners of the Grand Prize. There was a mix-up regarding the first prize in Class B, on which no doubt the Binghamton claims were based - but the facts are that Mr. J. A. Clay has the prize and his prints were on An-gelo. Will the Binghamton people acknowledge their error as we did in the Missouri case two years ago? No matter who has a letter or certificate (issued in error), who was finally awarded the prize? Who has it? Cyko again repeated former successes and won three times as many first prizes as all other developing papers. The Association Cup was awarded to a Cyko print by Mr. O. Hege-mann, this gentleman also winning the Cyko Cup, and congratulations are also extended to Messrs. T. S. Higginbotham, G. W. Miller, F. M. Boyd, C. R. Sauer, Jos. Lux and M. L. Potash, who captured various other awards. Here are the facts as verified by us in every instance where claim is made that our papers were used. We have letters, in every case, from the photographers themselves to prove our claims. First Prize - Jos. Lux, Sealy, 2 Artura, 1 Cyko. Second Prize - F. M. Boyd, Gaines ville, Artura. First Prize - C. R. Sauer, New Braunfels, Artura. Second Prize - T. S. Higginbotham, Anson, Artura. First Prize - M. L. Potash, Victoria, Cyko. *O. Hegemann, San Antonio, Cyko. *O. Hegemann, San Antonio, Artura. L. T. Powell, San Antonio, 2 Artura, 2 Cyko. First Prize - T. S. Higginbotham, Anson, Artura. Second Prize - Geo. W. Miller, Midland, Artura. In addition to above Mr. F. M. Boyd (Artura) was placed second in the Association Cup Class, though no prize was awarded. * Please note that Mr. Hegemann used Artura for the Association Cup, contrary to the statement in "Portrait," although, of course, using Cyko for the Cyko Cup. See Pages 16 and 17. Exhibits on Artura exclusively won three first prizes, mixed exhibits (with four prints on Artura and three on Cyko) won two first prizes. Cyko won one first prize. Perhaps they meant to say that Cyko won "one-third as many prizes as another developing paper," instead of "three times as many," and we shall gladly accept that explanation. 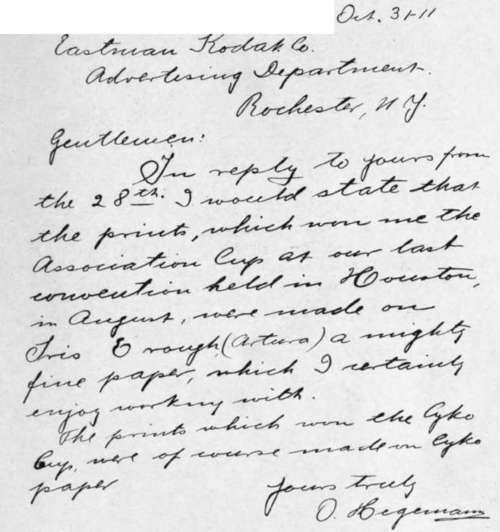 Texas is a long way from Rochester, but Uncle Sam's mails are still working and we have letters in every case to prove our claims. Will "Portrait" acknowledge its error? C. O. Towles, Washington, D. C.
First Prize - A. R. Nicholson, Peoria. Second Prize - C. L. Venard, Lincoln. First Prize - F. Fawkner, Cairo. Second Prize - C. L. Venard, Lincoln. N. S. Godfrey, Abingdon. Special Class No. 1. F. Fawkner, Cairo. FirstPrize - R. A. Heath, Pontiac. Second Prize - J. J. Fein, Chicago. First Place - C. C. Venard, Lincoln. Second Prize - A. R. Nicholson, Peoria. Of the foregoing eleven prizes nine were on Eastman papers, with three each on Platinum, Aristo and Artura. Of the seven first prizes six were on Eastman papers. And we have the letters from these prize winners to prove the statement. Perhaps this publishing of lists of winners with one's papers is not important. We are by no means sure that it is, and may in the future, as we often have in the past, let them go by without comment. But we shall not pass by any such flagrant cases of misstatement as that published in "Portrait" regarding the results in Texas. Will they admit that we are right or will they quibble? The Convention held at Houston, Tex., recently, was reported to be a success in every way, particular interest being displayed in the Cyko demonstrations. Cyko again repeated former successes and won three times as many first prizes as all other developing papers. The Association Cup was awarded to a Cyko print. by Mr. O. Hegemann,this gentleman also winning the Cyko Cup,and congratulations are also extended to Messrs. T. S. Higginbotham, G. W. Miller, F. M. Boyd, C. R. Sauer, Jos. Lux and M. L. Potash, who captured various other awards.